Pension Hara is located in Paros Island, Greece, on a small hill in Naoussa village, just above Piperi beach and has a superb view to the sea. Though it is just 200m away from the center of the town, the area is quiet, the perfect place for those who long for relaxing holidays. You can choose the type of accommodation that best fits your needs between self-catering studios and apartments for up to seven persons. 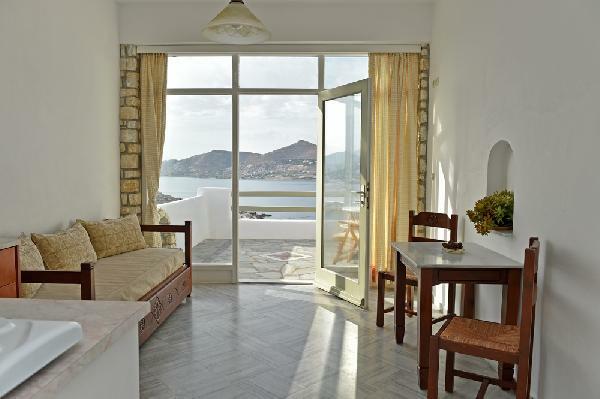 They all have an excellent open view to the bay of Naoussa, which you can enjoy from your balcony or veranda. Pension Hara is a well-looked-after accommodation offered at a low price. Hara in Greek means "happiness". 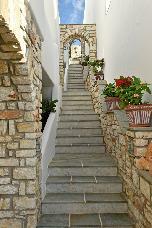 That's the feeling you get during your stay at our pension in Paros. From the top of the hill at Vounali area, you have the sea unfolding under your feet and the mountains around the bay of Naoussa gracing the horizon. Both small and bigger groups will find ideal accommodation. Our spacious apartments are actually homes themselves. They're nicely furnished and decorated, offering 3 bedrooms and 2 bathrooms, with a large living/dining room area and a fully equipped kitchen. In all the studios there is air-condition, TV, refrigerator and cooking facilities. They're all sunny and have balconies or verandas with open sea view. The pension is a family run operation and is very well-looked-after. It is conveniently located a few meters from the center of Naoussa, where you can swim in the central beach, and just 20m from the bus stop. In our rooms and studios you have all necessary equipment to make your own meals and there's also a mini market - food shop right next door. We want our customers to enjoy the best of our hospitality and we offer all types of accommodation at considerably low prices. 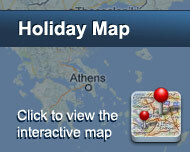 At Pension Hara you are bound to have happy holidays! Είστε ιδιοκτήτης ή διευθυντής στο HARA STUDIOS & APARTMENTS; Εγγραφείτε τώρα για δωρεάν εργαλεία, που μπορείτε να χρησιμοποιήσετε για να βελτιώσετε την καταχώρησή σας και να συνδέσετε την ιστοσελίδα σας και το σύστημα κρατήσεών σας.